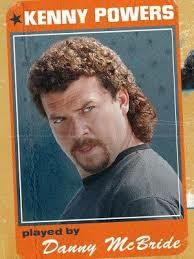 The new HBO Eastbound & Down show stars Danny McBride as Kenny Powers, a 35-year-old ex MLB pitcher who is forced to return to his home town to be a P.E. teacher. The story is exactly what you would expect if John Rocker was forced to go back to his home town. The show’s executive producers are Will Ferrel and Adam McKay. The men from funny or Die who brought you Pearl in The Landlord and Good Cop, Baby Cop. The show is great, at least the first episode was. To give you an idea, Kenny Powers’s motto is “You’re F**Kin’ Out, I’m F**kin’ In!” What more could one ask for?